Get your shades at the ready for this retro font. If you've just woken up, we can only apologise for subjecting you to one of the most colourful and flamboyant fonts we've ever come across. But if you feel like putting your eyes through their paces, meet Electra. 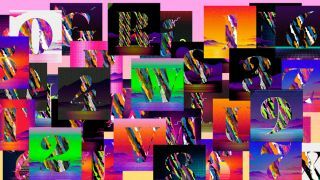 Created by Argentinian freelance designer Yai Salinas, Electra is a free-for-personal-use OpenType font that takes its inspiration from the gaudy and over-the-top 1980s. Are you up to the challenge of making this font work? That's not to say that Electra hasn't got a sense of style, and it certainly doesn't do things by halves. The all-caps font (because when your design is this balls-out why would you waste your time with lowercase wallflowers?) comes with numbers, alternates and symbols, plus it's available to download for commercial use if you sling a small donation Salinas' way. While other fonts mail it in by just relying on a unique letter shape, Electra makes clever use of colour, pattern and texture to deliver a truly individual typeset that could work as camouflage gear to help you blend into a Jackson Pollock painting. Elektra is available in three vivid styles, each with slight variations in pattern and colour. These different styles make the font more flexible to help you accommodate its bombastic aesthetic into your work. Scroll through the gallery below to explore the different versions.